Last-minute hike to the peninsula, a nice break from the Cascades. Got to the trailhead in the afternoon and it was just us there, either the earlier hikers had already come and gone or no one went up the mountain today. A few down trees on the trail in higher elevation but easy to get around, Judging by the well-maintained trail and a few wooden benches placed alongside, this place probably gets lots of visitors in the summertime. Pups and I started seeing snow shortly past the loop trail junction at around 3,100 feet. The old foot tracks were still visible so no snow accumulation. Also, it looked like most of the snow seen in last Sunday’s trip report had melted off quite a bit. There were enough tracks on the trail so no postholing or need for snowshoes, but I carried mine up just in case. Since much of the snow was gone, it had left the ice layer underneath exposed in some places. I forgot to bring microspikes along, but there was no use for them, and they would have served as more dead weight anyway. We made it to the summit half hour before sunset, just enough time for photo ops and sunset views. 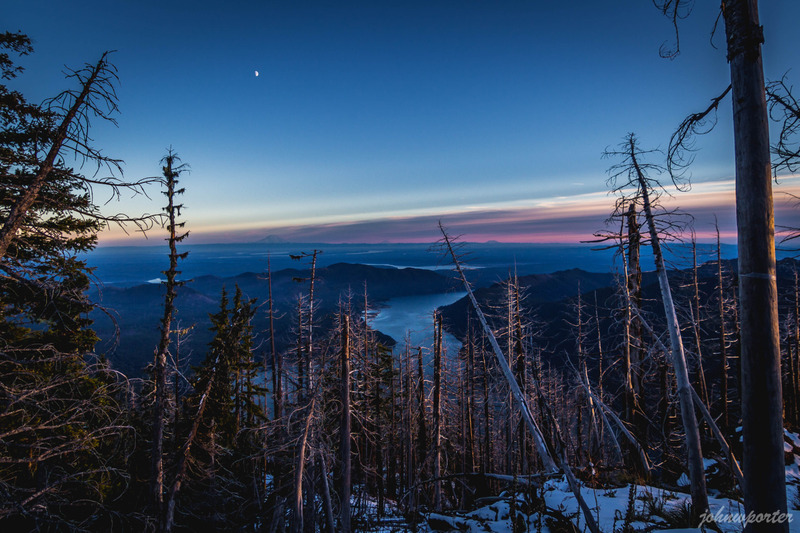 This was one woodsy summit, and views of Mount Ellinor or Copper Mountain to the north could only be obtained by peering through tree branches. Views to the south were gorgeous, with Lake Cushman stretching all the way across the mountain’s south shore. All three volcanoes–Rainier, Adams, and Helens–were visible. Although getting a good view of Rainier required some down climbing to lower steps on the south side. The summit rock was mostly dry, with small patches of ice and some residual snow. Just needed to strategically position my feet so I wouldn’t accidentally slip. Stayed about 45 minutes at the top and started making our way down the mountain before dark.